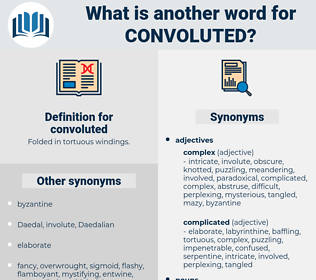 What is another word for convoluted? difficult, sophisticated, elaborate, challenging, tangled, warped, troubled, intractable, awkward, unwieldy, burdensome, over-complicated. exacerbated, aggravated, intermingled, fucked, compounded, confounded, Hindered, Hampered. complicated, confusing, cumbersome, tricky, messy. direct, clear, simple, straightforward, straight, uncomplicated, understandable. plain, simplified, uncoiled, noncomplex, uniform, unvaried, oversimplified, homogeneous, simplistic. Thus the large intestine encircles, in the form of a horseshoe, the convoluted mass of small intestines. complot, canfield, completed, convolute, confabulate, cosmopolite, conflate, complete, common fault, comb-plate, conviviality.